Would you like to have a knowledgeable national park bus tour guide “step-on” your bus tour? CFI is happy to arrange your Canyonlands step-on guides. 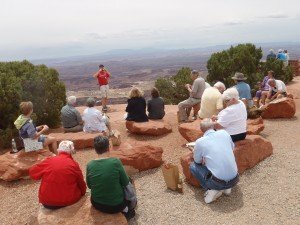 Our local naturalist will join your bus for a short tour through Arches or Canyonlands National Parks. Our interpreters have specialized knowledge of local geology, natural history, archaeology, and local lore. Let them entertain your guests with educational stories that will make their experience of canyon country a memorable event. Our fee begins at $350 for any tour up to 4 hours in length ($50/hr for each additional hour beyond the first 4 hours, not to exceed 8 hours.) Tour group operator pays park entrance fees. Canyonlands step-on guides do not lead hikes, though guests may take short hikes at viewpoints as determined by the tour operator. If you are interested in guided hiking services, please see CUSTOM full day hike/tour options which include additional staffing and services. For additional information, you can contact the Southeast Utah Group of the NPS at 435-719-2123. What months available: April through October, call to arrange.